In Bed and Breakfast in Cuba we will like to offer you the amazing’s casas particulares in Vinales. This is a spectacular location in Cuba that you should see when you visit the island. You don’t want to lose the sight seen in this town located in the Province of Pinar del Rio. Stay in Vinales Cuba and go around to see the national park among other places. As we say, Viñales is a small town located in the Pinar del Rio Province. Its exact location is in the north central part of this province of Cuba. The valley of Vinales is the most visited location in the province of Pinar del Rio and is a good place to spend a few days. The town center has its own charm but not a lot of things to see, the beauty is in its location and the surrounding sights. You will find small houses, one-floor constructions made of wood. And almost all have porches, where people hang around. This valley is dominated by mountains that are not so tall. They belong to the Guaniguanico´s Coordillera. Also, its landscape is mixed with a rocky environment. In these places, the locals still use traditional agricultural techniques in the cultivation of different products. But especially when they produce tobacco, an icon of this province. This particular place has cultural and natural landscapes mixed together. It´s a very rich society, multi-ethnic. Here you will get in touch with the traditions of the Caribbean and Cuba at the same time. These characteristics that we mention, among others, are the ones that make this valley a tourist attraction. It has landscapes full of green that can captivate every visitant. It´s not so far from Havana, about 170 kilometers. This landscape is one of the most spectacular locations in Cuba and is nestled in a verdant valley full of tobacco farms. But it also has caves and strangely shaped limestone hills known as mogotes that go as high as 300 meters. This town and region it´s known and appreciated by Cubans. 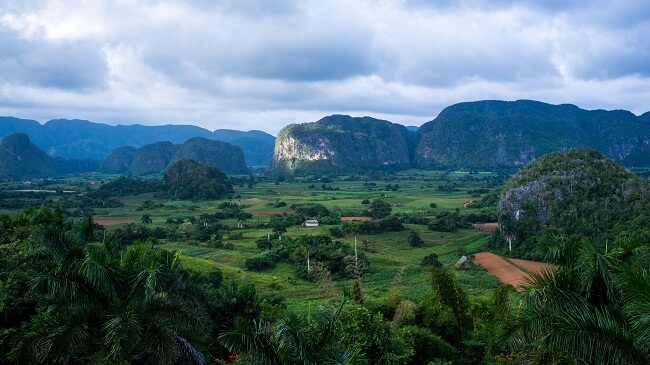 People from this country identify with the Viñales Valley. They know about its cultural and importance. Not for nothing this town has this UNESCO title. Its landscapes are amazing, but also its cultural heritage. It has everything for tourist. Among the reasons for visiting this town are Diving, Food, Flora & Fauna and Climbing. You will have the opportunity to do this and more when you visit Viñales. We like to recommend you to stay in casas particulares in Vinales, this is an option for any kind of travel budgets. And it's the perfect opportunity to get in touch with the locals, also to learn more about this region, its history, culture, and landscapes. Do not miss the opportunity to stay in Bed and breakfast in Vinales. People in casas particulares in Vinales are waiting for you. Choose one location in our catalog. The confirmation happens immediately, you don’t have to wait.